Description: Inspired by the popular Mission revival movement, this handsome minimalist design features welcoming light-evoked through stunning Clear Frosted Glass. The attractive lens is enhanced with hardware and straight line accents offered in a Craftsman Brown finish. This Pier Mount, which can illuminate a pier, deck, patio or column, is ideal for fine interiors and exteriors. Handcrafted by highly skilled artisans in our 180,000 square foot manufacturing facility at the foothills of New York's Adirondack Mountains. Custom colors, sizes, and styles are available. Dimmable energy efficient options such as LED are offered. 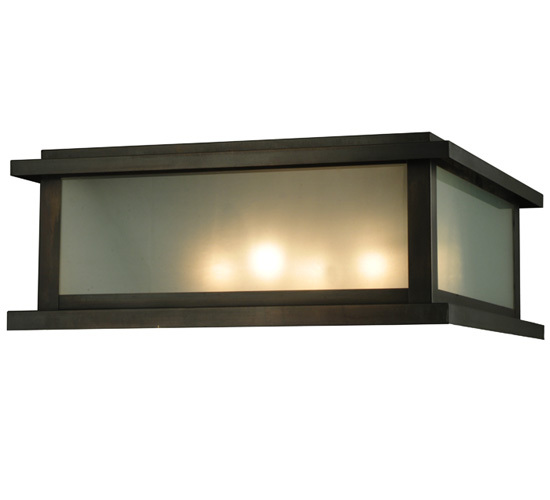 The 30-inch square fixture is UL and cUL listed for damp and dry locations.